Look at that sweet little face. You are the cutest. You are a lover who just wants to play. Hi cutie Kikko! Happy Dog of the Day! What a beautiful Shih Tzu you are, Kikko, a 17 lb lump of pure love on 4 legs; a lover not a fighter; the consummate snuggle buddy! What more could a family hope for in a furkid, I ask you! YOU, Kikko, live the saying "never met a stranger!" No wonder all who meet you, humans and furry ones alike, fall hopelessly in love! How blessed your human is, having a furkid as big hearted, as beautiful, as sweet and loving as you, Kikko! You truly are a treasure, one in a million, simply the best! Thanks for the BIG smiles, sweetheart! Meeting you today, seeing your heart-melting photos (no way you're 14 years old! ) has made my day! I hope you're enjoying a very special day of celebration, sweetheart...meeting new people and making new friends, playing with your doggie buds and snuggling with your human, being loved and pampered to pieces, treated to all your heart desires and more! Lots of love, cuddles and kisses to you, precious Kikko, our very special and most deserving Dog of the Day, EVERY day! Dearest Kikko, you are adorable! What a sweet, precious little Shih Tzu you are! You have the most delightful personality, too. You are "a little 17-pound lump of love," a true sweetie. You are your dear person's snuggle buddy, and you and he/she love each other very much, don't you. What a wonderful love-filled home you share! 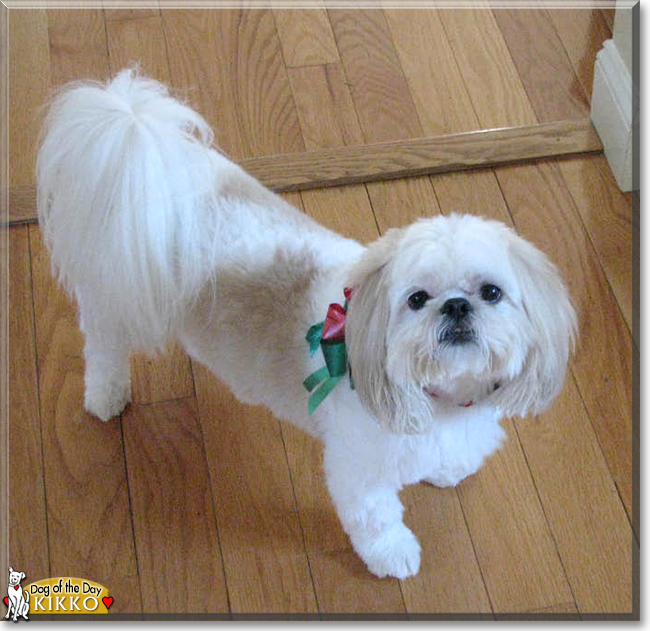 Congratulations, darling Kikko, on being chosen today's Dog of the Day! We hope you and your dear person and all your family and friends are enjoying a fine celebration, full of fun and lovies and all your favorite games and treats. Kikko is crazy cute, sweet, adorable and irresistable! Simply the most darling little DOTD in the whole, wide world! Hurray for Kikko! Congratulations on being Dog of the Day, beautiful Kikko!